The nest sits nearly a hundred feet up in a lone loblolly pine in Richmond, where a pair of eagles makes their home along the fall line of Virginia's longest river. The James shallows out there, sliding over rocks and rapids, providing an abundance of food for the local raptors. Researchers from the Center for Conservation Biology (CCB) are studying the Richmond nest—and others—via strategically placed video cameras. They are observing the birds' interactions and behaviors, and an interesting story unfolds as the eagles star in their own reality show. Courtney Turrin, a graduate student in William & Mary's biology department, has been leading the CCB's video-based investigation of the domestic life of eagles. The CCB has documented the repopulation of the national bird in the Chesapeake Bay region. In 1970, she noted, there were fewer than 20 pairs of bald eagles breeding on the Bay. In the prime nesting habitat along the James River, the bald eagle population has grown from zero to record-levels in 40 years. Now, there are so many eagles in the area that their domestic life is interesting. Bald eagles, which can live up to 30 years in the wild, are extremely territorial. In general, they mate for life. Many eagles are, in human terms, good spouses and parents—loyal to their mates and good providers for their young. But all eagles aren't the same. There are eagles that cheat on their mates and birds that seem to want to hang around and loaf when they ought to be out on the river bringing home the bacon—or rather, the fish. Bryan Watts, the director of the Center for Conservation Biology, says that it seems that as the eagle population goes up, the famous monogamous nature of the birds begins to go down. "The thinking has always been that pair fidelity is high," Watts said. "But my guess is that it's not as high as people think. We have places like the upper James where density is just phenomenal and I have to believe that there is a lot more extra-pair 'cheating' going on." Eagle researchers even talk about "divorce rate" among the birds; Watts said the eagle divorce rate is thought to be around 15 percent. Both males and female eagles will cheat, he said. "The most likely scenario is that Charlie's off fishing somewhere and Joe comes in to mate with the female while she's at the nest. Charlie comes back. He doesn't know what's happened but he ends up raising Joe's chicks," Watts explained. Researchers are checking the stray rate, he said, by comparing DNA of feathers collected beneath nests in different years. There also are instances of what humans call home invasions. Turrin notes that researchers use the term "next intrusion" for events when one eagle forcibly interrupts the domestic tranquility of the resident pair of birds. The nest-cam project aims to examine eagle nesting behavior—good and bad. 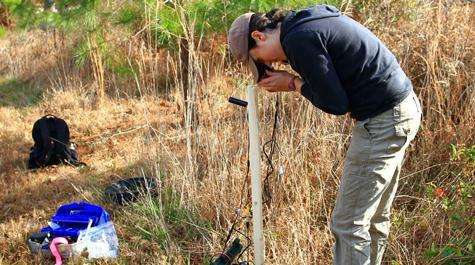 Turrin had 12 study sites, including the live-streaming webcam loblolly nest. Each nest in the study had a camera set up as much as 100 meters away to monitor activity around the nest site. Turrin and other CCB researchers have been going through the hours and hours of eagle videos, logging various behaviors. She explained that in addition to the population density per se, the number of single adult eagles causes some friction. "There is a higher proportion of non-breeding adults because of the number of birds and the limited availability of nesting territories—and we are observing sneaky behaviors by young males. We're seeing some nest intrusions," she said. The female birds don't seem to mind. In fact, some are exhibiting polyandrous tendencies, which Turrin points out is not beneficial to the breeding male because he might wind up investing his energy in raising chicks which aren't even his. Or he invests his energy in "mate guarding" which takes him away from his other duties. This past season, Turrin says that she observed both adult intruders and a lot of younger juveniles crashing nests. "We're not sure who those juveniles are," she said. "Maybe they are chicks coming back to their natal territory. Or maybe they are coming out of a sense of curiosity? We can't be sure. Bald eagles are social creatures." Even without family squabbles and social problems, the James River eagles live a harsh reality. For instance, after Hurricane Irene hit last August, the CCB conducted surveys along the James River and found that a number of nest trees had been lost or damaged in that storm. At this writing, a post-Sandy evaluative flight in the Chesapeake area has not been conducted, but Turrin noted that Sandy hit harder to the north. "I suppose that the biggest impact from Sandy will be on breeding pairs in New Jersey and New York," Turrin says. "At this time of the year, most pairs are performing nest maintenance activities. The females will lay their eggs around late December through early February, so there is still time for pairs to repair or rebuild nests if any were lost or damaged in the storm." 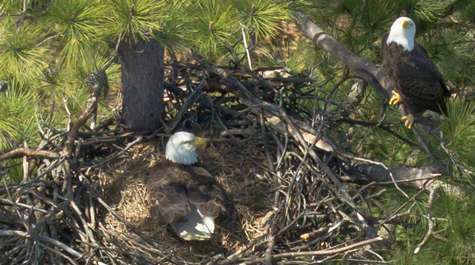 The Richmond eagles were the public stars of the initiatives; their nest was not only recorded like the other 12 nests, but also streamed over the web. They developed a base of fans, who named the adults James and Virginia. Many of the internet eagle watchers got a little more nature than they bargained for: shortly after both eggs hatched, one of the chicks began pecking its sibling. "The CCB stopped live-streaming from the Richmond eagle cam at the end of the nesting season this past June, when the birds fledged," Turrin says. "I think that the camera will go live again sometimes in the coming weeks." While the Richmond cam is off line, you can view the video footage entitled 2012 Season in Review. You also can "like" the Richmond eagles on Facebook and become a part of a fan base that stretches all over the Commonwealth and beyond. The Richmond loblolly nest has been home to the same eagle pair for more than ten years and has produced 20 chicks since 2001, including two in 2012. James and Virginia are reliable parents, but the eagle cam showed how even experienced parents can face challenges. The birds don't start to breed until they are five years old and their nesting season varies by region. "They go through progressive plumage changes," says Turrin. "If you are looking at a bird that's not an adult yet you can tell its age by coloration of feathers and the beak. That's helpful to use because we are interested in identifying 'floaters,' or non-breeding adults, who are intruders." In Virginia, bald eagles start working on their nests in the fall; egg laying starts in mid-December and will extend to mid-February. Then, the chicks usually fledge at around 12 weeks, although they will still hang out around the nest for a short time, from a few weeks up to a month. Chicks are hatched once a year, as there is only one clutch—or laying of eggs —per year. The females usually lay between one and four eggs. If the nest fails they can re-nest if it's early enough in the season. Any potential stressors can cause a nest to fail—harsh weather can cause the sturdiest of branches to snap; owls and other nest predators can target the eggs or chicks. "Or a nest might fail if the eggs are not properly incubated," says Turrin. Meanwhile, at home in the nest, males and females play traditional roles with the female incubating or brooding (once the chicks have hatched until they can self-thermal regulate). The male is the provider. Parents are definitely invested in the chicks because they usually only have between one and three a year, Turrin said. "The male bird gets the food, but the female and male share the feeding duty. Also, the adults have a stronger response to intrusion when both of them are there [at the nest]—the male usually chase off or attacks the intruder," Turrin says. After they fledge, the parents will continue to bring food for a few weeks but after a short time – a few weeks or a month – the fledglings will have to learn to forage on their own as the parents have to start working on a nest for the next breeding season. As the seasons pass and the population continues to move toward saturation, where most of the viable nest spots habitat will be occupied, what are the younger males to do? Scientists have hypothesized that territorial intrusions will impact reproductive success (and therefore population growth rate) of bald eagles in the Chesapeake Bay. Turrin is investigating this hypothesis. "The data I collected last field season suggests that breeding males face a trade-off between nest defense and foraging for food to provision to their chicks," Turrin says. "Elevated rates of intrusion could force males to spend more time defending the nest, thus compromising their ability to adequately provide for their offspring, possibly leading to diminished reproductive success." Intrusions are occurring at active nests and breeding pairs are responding to these intruders by defending their territory, sometimes aggressively. "What comes next is to determine the indirect impacts of these intrusion events on the breeding pairs," Turrin says. "To do that, our focus going into the next field season will be on the tradeoff breeding males face and how their time budgeting is forced one way or the other by intrusion events." Stay tuned for scenes from next season.